Have you seen all of the cuteness at Build-A-Bear Workshop? 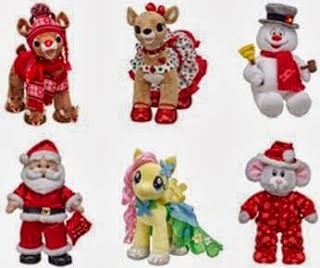 They have the most adorable animals available right in time for the holidays! We were sent just a few of their amazing new line and we LOVE everything. 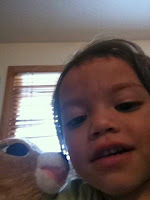 My youngest daughter is in love with Clarice. She has a heart that lights up when you press her ear. She came dressed in adorable red sparkly shoes and a holiday dress! My daughter has brought her to show and tell multiple times since she arrived! She even stole my phone so she could have a selfie with Clarice. 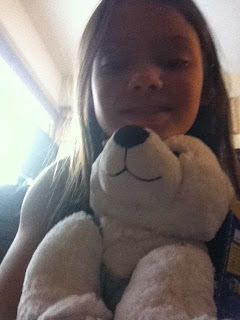 My oldest daughter enjoyed the Glistening Winter White Polar Bear. She came wearing a blue dress and shoes. The Polar Bear could easily be dressed up in a more masculine outfit for a boy as well! 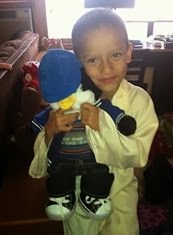 My son loves his new Super Chill Pengy the Penguin. Pengy came dressed in a complete outfit with shoes, a hat, pants, shirt, and even a coat. My son loves having all of the clothing options, and sleeps with Pengy every night (and brings him to school every day). All of the Build-A-Bear Workshop animals are completely adorable, and you can buy many clothing items, accessories, and more for each one to make them personalized to your child! Want to win a $25 gift card to Build-A-Bear Workshop? Enter below! I like the Jolly Frosty the Snowman the best! Thanks for the giveaway! i want a Nose So Bright Rudolph!! LOVE!!!! Our daughter would LOVE Rudolph!!! My lo loves the Monkey! I like they little ponies. My son would love Pengy the Penguin! I like the Frosty the Snowman. Cheerful Monkey, Sea Turtle, Jazzy Frog... there are too many to choose!!!! My grandson would like the 16 in. Frosty the Snowman. I would like to get my grandson Frosty the Snowman! I love Pinky the Penguin! Oh I would love to get Carter the Nose So Bright Rudolph the Red-Nosed Reindeer®! So cute for the holidays! I love Nose So Bright Rudolph & Glistening White Winter Bear. The girls want a My Little Pony one. My little pony its beautiful. I can't decide!! LOVE all the wild animals!! Probably zebra or monkey! My daughter would love the my little pony pinkie pie. Great giveaway! LOVE Nose So Bright Rudolph. Thank you!! I love the 16" Arctic Polar Bear! I like Frosty the Snowman. i like the my little pony-rainbow dash the best, thank you! The Frosty the Snowman. It's perfect for Christmas! The Reindeer is so very cute !! I believe I saw a picture of Fluttershy and my little girl is a HUGE My Little Pony fan. I really like the cute 16 in. Elephant. I would love the Rudolph or Frosty!!! Classics all the way! I like the 15 in. Winter White Polar Bear! My daughter would love Winter Waddles Pinky the Penguin! Thanks for the great giveaway! I like the batman bear, santa and spongebob. I love the Cool Dude Pengy the Penguin! I like the sparkle bunny. Thank you! My niece would love Pinkie Pie! On form as Tonya E Hopkins and she would love Fluttershy! I think my daughter would love the 15 in. Bearemy's Kennel Pals® Golden Retriever. There are so many cute choices! I really like Snuggle Up smallfrys Hot Cocoa Moose. He would make a cute decoration on the table near our front door this holiday season. I love Merry and Bright Clarice and Lucky Kitty! I think the Rudolph is THE cutest thing ever. 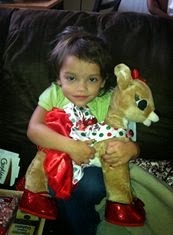 I was thinking I would get our daughter the Merry Mouse since she adores the mouse we got her for her first Christmas. Then she found a Build A Bear catalog/mailer and discovered the My Little Ponies... She immediately fell in love so I would love to be able to put one of the ponies under the tree for her. i love the Frosty the Snowman!! I like Rainbowdash for my daughter.